Everyone here is well and things are back to normal. The girls are back in school this week and Clint is working again so all is good. I took the girls to their little friend Riley's birthday party last Saturday and when we got home realized that Taylor had a fever. That was the beginning of what I thought was the "fever virus" but was later told was the swine flu. It has been a whole week and the girls are still not 100%. Sutton had a very mild case but Taylor's cough seemed to be getting worse and they both ran a fever on and off for almost a week so Friday I took her to the doctor and bless the poor child's heart...she has a double ear infection on top of the flu. I told Dr. Darby that Sutton also had a fever so she wrote an Rx for an antibiotic for them both to try and knock all of this ick out and get my babies well!!! So two whole days of MDO and the girls missed the entire next week...ugh! I hate it because everyone else has had time to get acquainted with the new teachers, room, schedule, etc. and they will be playing catch up. Also, Clint has the swine flu as well...and he has been hit much harder than the girls. I think it's probably because of his diabetes. He started feeling really bad on Tuesday but was supposed to be flying to Providence that morning. I helped him take some things to his car when he was leaving for the airport and he was soaking wet w/ sweat but cold. He went ahead and said he just had to go but was back at home w/in 45 minutes and never even made it all the way to the airport. Wednesday he went to the doctor and was also diagnosed w/ swine flu. He caught it on the upswing though and was able to get Tamiflu but it honestly hasn't helped him at all I don't think. He feels just as bad today (day 5) as the first day and has been upstairs in the guest room basically since Wednesday laying in bed. So, it looks like he will be going back to the doctor again on Monday. I just pray that I don't get it!!! 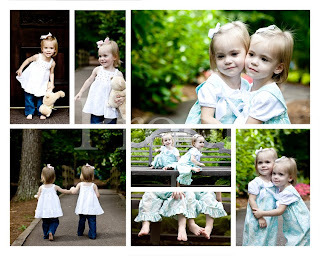 I finally got the collage of pictures that I chose from Taylor & Sutton's 2 year old photo shoot. I love, love, love it and it looks great in the den. I had it printed on a canvas rather than just photo paper, but you can't really tell that by these pictures. I am going to find a way to do this myself! I know these pictures are not so great but they are all I could get yesterday. I would have much rather had the girls in something really cute and sassy for their first day of school but I promised the new teachers that I would put them in a shirt with either an initial or name on it for the first couple of weeks...so they went casual w/ a shirt and denim shorts. I don't know exactly what they did at school yesterday but it was apparently a ton of fun. These two were so wound up when they got home that they jabbered for a solid hour about it. And they were also extremely lovey towards me the rest of the day wanting to snuggle, hug, kiss all afternoon and evening. I LOVED it! Sutton asked me to snuggle w/ her last night while watching TV and she started playing w/ my hair and said "mommy have pretty hair" and Taylor told me when I was getting them ready for bed "Mommy perfect!" My little sweeties.